Faine Elementary Pre-K students have spent their school year learning about community and service. This year the school raised funds during a “Super Hero Fun Run.” The proceeds raised by the Pre-K students were donated to the Dothan Police Foundation today. Torren Edwards, a Pre-K student, presented the check to Chief Parrish this morning. “The DPD has continually supported our classroom through the years, and this is a small token of our appreciation,” says Tiffany Smith: Lead Pre-K Teacher. 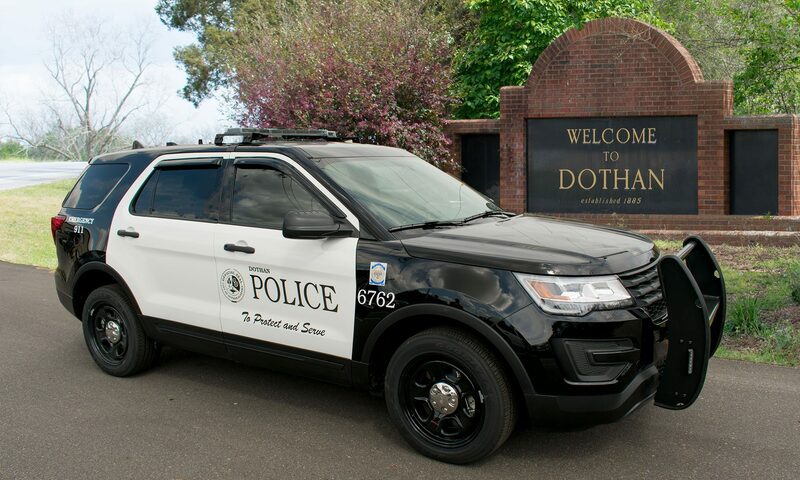 On behalf of the Dothan Police Department and its Foundation, we say “Thank You” and have a great summer. On 05/23/2017 at 9:14 p.m. Patrol Officers were dispatched to a “shots fired” call in the area of S, St. Andrews Street and E. Selma Street. While Officers were responding the call was changed to “motor vehicle accident” with injuries in the 700 block of E. Selma Street. The arriving Officers discovered the driver of the vehicle at the scene was suffering from a life threatening gunshot wound and had been in a traffic collision. The victim of the shooting was transported to a local hospital and underwent surgery. He remains at the hospital. Investigators have learned that this was a result of an altercation between two separate groups in three or more cars. The 700 block of E. Selma Street was closed for several hours as Criminal Investigators, Crime Scene Technicians, and Traffic Homicide Units processed the scene and collected evidence. Anyone with information on this case is urged not to take matters into their own hands and to contact the Dothan Police Department at (334)793-0215 or CrimeStoppers at (334)793-7000. On 05/23/2017 at 2:14 p.m. Patrol Officers were dispatched to a robbery in progress at the Wells Fargo Branch located at 112 W. Cottonwood Road. One suspect entered the business and demanded currency then fled the scene in a vehicle. Units quickly arrived on scene began gathering information. Thanks to witness information gathered at the scene a description of the vehicle was broadcast to all responding units. The suspect vehicle was observed near the intersection of Main and Oates Street by an officer. The vehicle was stopped in the 200 block of N. Bell Street and the passenger fled on foot. Following a short foot pursuit the suspect was taken into custody. The driver was taken into custody by other responding units. Investigators have arrested and charged 51 year old James White, of Roberts Street, with Robbery 1st degree. Investigators have arrested and charged 69 year old, James Edward Mathis, of Fountain Street, with Robbery 1st degree. Bond will be set later today. All persons arrested are innocent until proven guilty in a court of law. On 05/21/2017 Investigators arrested and charged 24 year old Crystal Denise Anderson, of N. Range Street, with Theft of Property 1st degree. Bond has been set at $30,000. On 05/21/2017 Patrol Units responded to a robbery of a person in the 3000 block of Ross Clark Circle. The victim had been robbed at gunpoint by two suspects. A short time later Units located one of the suspects in the 1000 block of the Ross Clark Circle. Investigators executed a search warrant in the 1000 block of Ross Clark Circle. Investigators recovered items related to the robbery and illegal narcotics. Investigators have arrested and charged 43 year old James Amar Woods, of N. Herring Street, with Robbery 1st degree and Unlawful Distribution of a Controlled Substance. His bond has been set at $90,000. Investigators have arrested and charged 31 year old Jessie Lee Cobb, of N. Alice Street, with Unlawful Possession of a Controlled Substance. Her bond has been set at $10,000. All persons arrested are innocent until proven guilty in a court of law. The investigation is ongoing and more charges are expected. On 05/20/2017 Investigators arrested and charged 31 year old Jimmy Lamar Berry, of Koonce Street Columbia, with Certain Persons Forbidden to Possess a Firearm. This is following patrol units stopping a vehicle driven by Berry and locating his firearm. Bond has been set at $15,000. On 05/19/2017 Investigators arrested and charged 24 year old Xavier Demetrice McCray, of Maulding Drive, with Certain Persons Forbidden to Possess a Firearm. This was after patrol units stopped a vehicle that McCray was a passenger in and located his firearm. Bond has been set at $15,000.